A sweet-smelling room can be difficult to maintain, especially when there are family pets involved. Odors ingrained into couches and chairs can make your whole house smell funny. If your living room is the victim of last night's fried fish, your husband's musty cigars or a parade of beloved four-legged family members, try a few easy techniques for freshening up the furniture. It's a simple process to alleviate odors from couches and chairs. 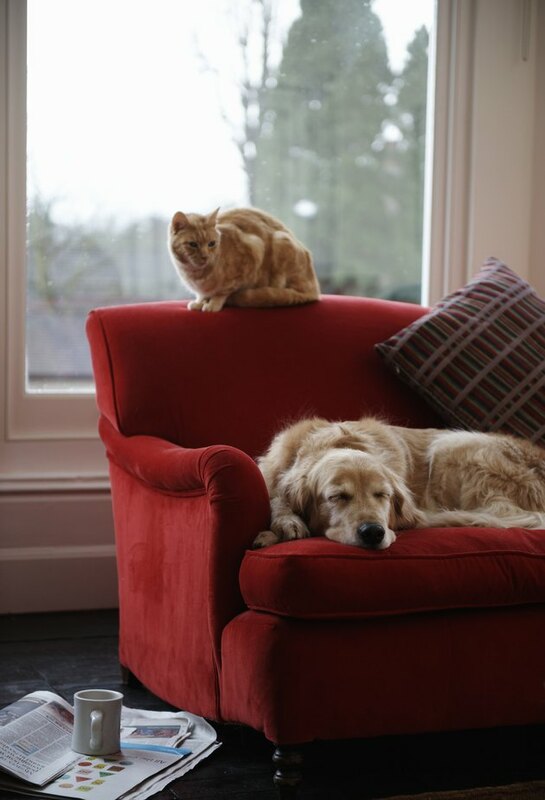 Probably the best way to keep chairs and sofas smelling fresh and new is to limit the amount of time your pet spends on them. Even the cleanest cat or dog goes through times when it smells like, well -- cat or dog. If you absolutely must have your four-legged friend beside you when you're watching your prime time shows, dedicate a soft, comfy blanket just for him and keep it on the chair in his favorite spot. Use something that washes easily and toss it in the laundry often. You might also want to keep an eye on pets that mark or spray. Having your pet spayed or neutered goes a long way toward alleviating this problem, but if your pet developed the habit before you had him fixed, breaking him of it could be difficult. Talk to your vet for reliable techniques. Fabric refresher does a good job of alleviating odors in your couch or chair. Use the spray kind that goes on easily and dries almost instantly. You might also place scented fabric softener sheets or sachets between the cushions for a burst of pleasant aroma anytime someone sits down. If your furniture has wood trim, buy a nicely scented furniture polish and use it to wipe down all the wood once or twice a week. If your couch or chair has removable slipcovers, launder them one or twice a month and dry them with scented fabric softener sheets. For furniture with permanent covers, buy or rent an upholstery cleaner and try it out on a section of chair that doesn't show, such as under a cushion. Allow the test area to dry completely and then examine it for any damage. If it looks clean and undamaged, give your whole piece a nice cleaning. Nothing freshens up a space better than Mother Nature. Crack open a few windows in your home to take advantage of cross-ventilation and let a comforting breeze blow any odors away. You might also invest in appliances that use charcoal filters to remove contaminants in the air. Cleaning your upholstery with a vacuum that uses one of these filters helps eliminate common causes of odors, such as pet dander, bacteria, cooking odors and cigarette smoke. Anne Goetz shares her parenting and career experience with North American Parent, Hagerstown Magazine, c0ws.com, Lhyme.com and a variety of other online and print publications. A mother of two with a degree in communications and a long history in management, Goetz spends her spare time hiking, camping and blogging. She is the author of the site, An Unedited Life: The Ultimate Blog for Freelance Writers. Why Does My Bedroom Smell Bad?